Presented by Dr. Pedram Argani and prepared by Dr. Robby Jones. This is a 56 year old female with primary sclerosing cholangitis who has her gallbladder removed. 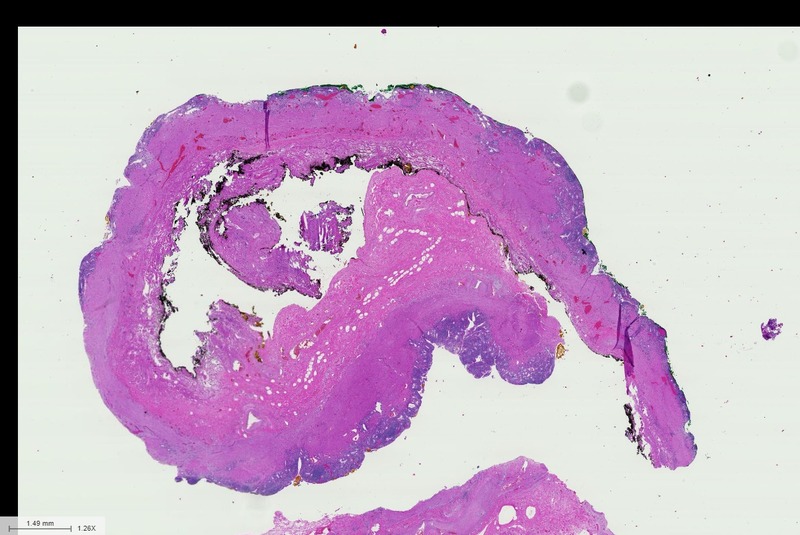 Histologic Description: This gallbladder demonstrates a diffuse superficial lamina propria infiltrate of lymphocytes and plasma cells. This gallbladder did not contain stones. These are the typical features of the cholecystitis associated with primary sclerosing cholangitis; however, it has been shown that this feature is not entirely specific, as it may be seen with any cause of obstruction of the common bile duct. 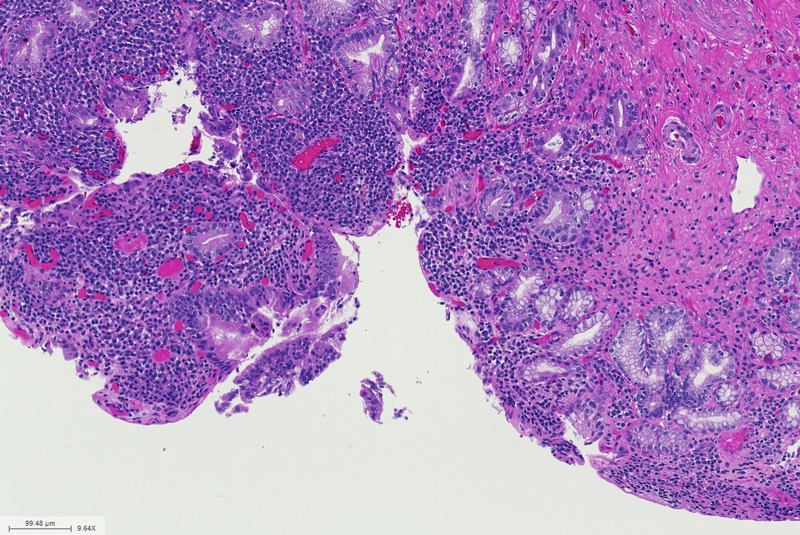 Primary sclerosing cholangitis is one such cause, but choledocholithiasis or a pancreatic adenocarcinoma obstructing the common bile duct are more common causes in our experience. Differential Diagnosis: The usual stone-associated cholelithiasis is characteristically inflammation-poor, and predominantly characterized by thickening of the gallbladder musculature. Eosinophilic cholecystitis is defined as a cholecystitis in which eosinophils are out of proportion to other inflammatory cells. 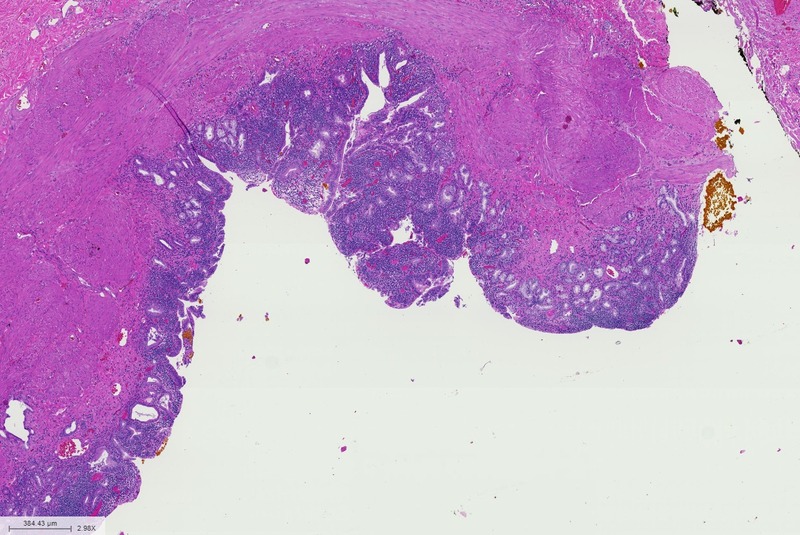 Xanthogranulomatous cholecystitis likely results from rupture of Rokitansky-Aschoff sinuses with extrusion of bile that stimulates a florid histiocytic reaction. 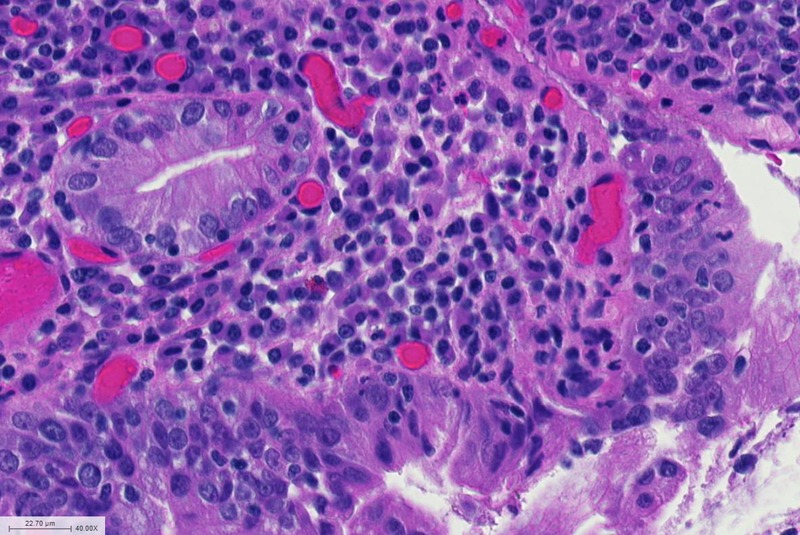 This reaction may be associated with scarring and clinically mimic a neoplasm.